Ft McMurray's HomepageHealthDeb Haaland Is One of the First Native American Congresswomen. It Took Two Centuries. Deb Haaland Is One of the First Native American Congresswomen. It Took Two Centuries. Deb Haaland wears the same pearl necklace almost every day. Not a string of delicate iridescent beads that are usually coupled with the blazers and skirts on Capitol Hill, but a set of sturdy, silver Navajo pearls that she bought at the annual Santa Fe Indian Market. Soon, those beads will be making their debut in Washington D.C. following a midterm election cycle that resulted in a historic number of women taking congressional seats in the 116th Congress. Haaland is in that group. She’s Native American. She’s a single mother. She bucks against the status quo. And she’s New Mexico’s newly-minted Congresswoman. A member of New Mexico’s Pueblo of Laguna tribe, Haaland, 57, is now one of the first Native American women to serve in Congress. On Tuesday, she took the lead against her opponents, Republican Janice Arnold-Jones and Libertarian Lloyd Princeton, making history alongside another Native American congresswoman, Sharice Davids of Kansas. The two share more than the obvious connection in heritage and their new House status—Haaland and Davids go back, having supported each other since attending the same summer program at the American Indian Law Center. It’s not hard to believe. The generational power of women and unbreakable family ties are embedded in Haaland’s DNA, she says. Her mother, who served in the Navy, raised Haaland and her two sisters and brother while her father, who was in the Marine Corps, fought in Vietnam. Haaland reflects on the unseen and under-appreciated work and the emotional labor that mothers often shoulder to keep the families together. If anything, she has the background and resumé to do just that. 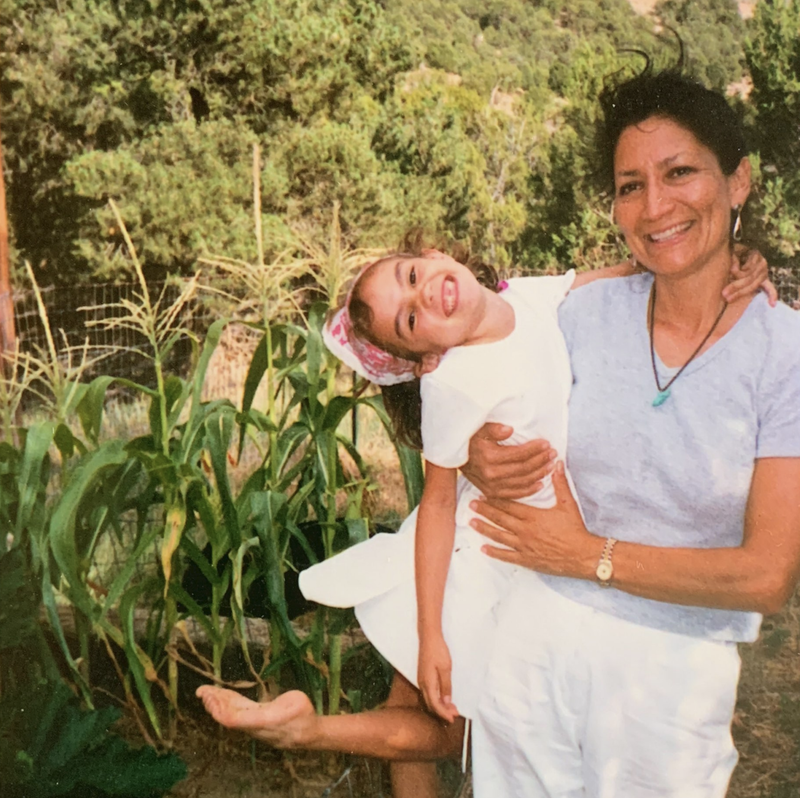 As the kid of military parents, Haaland moved around a lot, but New Mexico is her home base: She graduated from high school in Albuquerque, and went to the University of New Mexico and UNM Law School. Significant to Haaland being a first is that she’s also a working class indigenous woman who forged her own path into politics, without a silver spoon: As a young mom, she started a salsa company in the 1990s, delivering cases of the stuff out of her Maroon GMC Safari to grocers and gift stores across New Mexico. Her then-two-year-old daughter Somah would ride in the passenger seat. “I wanted her with me 24 hours a day because I felt like I needed to influence her at that early age and it paid off,” she says. Deb Haaland pictured with daughter Somah. While pursuing her law degree, Haaland made ends meet with the assistance of food stamps. And with such a busy schedule, she had to teach Somah how to ride the city bus to school in case her mom couldn’t be there. She earned her organizing chops volunteering for dozens of local and statewide campaigns, and mobilized native voters on the 2004 John Kerry campaign and both of Barack Obama’s campaigns (she served as Obama’s Native American vote director in 2012). She eventually became the Chair of the Democratic Party in New Mexico and ran for Lieutenant Governor in 2014. She’s also served as chairwoman of her tribe’s economic development corporation. Dedicating much of her career to getting out the native vote has primed Haaland to work even harder to protect it: In recent weeks, the Supreme Court upheld a law in North Dakota that requires voters to show identification with a current street address, when many reservations don’t use physical street addresses, leaving thousands of voters disenfranchised and unable to vote. “Native Americans couldn’t vote in New Mexico until 1948, [but] we’ve had elected officials who are deeply invested in making sure underrepresented folks get to the polls,” Haaland says. “Every time I think about the voter suppression happening in our country it makes we want to win even more so I can go to Congress and work to overcome that,” she told Glamour before Tuesday’s victory. For those who can’t vote, Haaland is hoping to be their voice: Just as she stood with activists at Standing Rock to protest the Dakota Access Pipeline, Haaland is committed to expanding the use of renewable energy in her state, and securing strong healthcare and education. Her inclusivity efforts won’t stop at her community, either: Somah, who’s now 24 and identifies as queer, has educated her mom on gender identity and LGBTQ issues. Haaland’s campaign priorities include working to close the pay gap for black, Latina, indigenous, genderqueer and transgender people, and fighting “bathroom bills” that restrict trans people from using public restrooms. She’s unabashed about her criticism of Trump, too. Haaland’s called out the president’s immigration policies, which have separated thousands of children from their families at the U.S.-Mexico border, and she is vocal about abolishing ICE. “It’s history repeating itself for no reason, other than a president who is just putting forward the most racist immigration policies we’ve almost ever seen,” she says, comparing the historic separation of Native Americans to the separation of migrant children from their parents. But what makes Haaland so accessible, such a beacon for her community, is that she feels free to bare it all. Like many women who ran for office this election season, she didn’t hide parts of her story that might traditionally hurt a candidate. In one of her campaign ads, she climbs Albuquerque’s Sandias Mountains while revealing that she’s 30 years sober. “Deb Haaland’s campaign for Congress is a representation of the culture shift that is being led by Native and Indigenous women to build a future that is safe, abundant and connected,” says Vanessa Roanhorse, CEO of Roanhorse Consulting and cofounder of Native Women Lead. “We need a voice that can advocate for women’s reproductive rights, pushing for stronger laws to protect women and children from violence and closing the pay equity gap that women, specifically Native American women face, and a voice that has directly experienced the disparities themselves,” she continued. What isn’t lost on Haaland is how this moment almost didn’t happen. While enrolled in Emerge New Mexico—a leadership and training program with the goal of getting more Democratic women into public office—she says she learned that if you ask a man to run for office, he’ll say yes the first time. Women, Haaland says, have to be asked seven times before they’ll actually run. It’s a good thing she did: Along with Davids, Haaland’s historic win means that two Native American women—on the land where her indigenous ancestors lived—are now U.S. Representatives. It took more than two centuries from the time Congress was established in 1789.